CD review: "Ticket to Chicago"
This review first appeared in the May 2, 1997 issue of the North County Times. Dave Hole plays guitar the way an 8-year-old plays Nintendo  with ferocity, grace and, yes, artistry. (Hey, I said an 8-year-old on Nintendo, not your or me.) The intensity of his solos certainly belies the stereotype of Aussies being too laid-back for the blues. 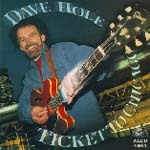 Due to a hand injury playing ball as a kid in his native Australia, Hole plays guitar with his right hand slung over the top of the neck, slide over the index finger. Okay, so it looks weird  but whether because of the odd style or despite it, Hole is one of the hottest slide players on the blues scene today. Coming over the top gives him more room to explore the full range of the guitar, and he does. This is Hole's fourth album, but the first recorded stateside  Chicago, to be exact. And for this date, Alligator Records surrounded Hole with some of Chicago's top blues talent: Bill Branch on harmonica, former Icebreaker Johnny B. Gayden on bass and Ray "Killer" Allison on drums. Not surprisingly, this is his best album to date, with solid arrangements and songwriting that let Hole show his chops in their best light.